A true colossus of Cornish rugby Charles Robert “Bonzo” Johns has passed away at the age of 80. He was a player revered not only by those he played with, but also and perhaps just important, those he played against. This was so well epitomised the last time he played against Gloucestershire in 1970 when at the final whistle the whole of the Gloucestershire pack, which at that time included many International players, hoisted Bonzo on their shoulders and chaired him off the field in recognition of their great battles over the years. He was also a firm favourite with the crowd wherever he played, Bonzo loved the crowd and the crowd loved Bonzo. In the 1950’s and 60’s there wasn’t a household in Cornwall that didn’t know who was Bonzo. Working on a Saturday morning as a coalman would see him cycle to Redruth from Portreath on his bicycle. Later on many will remember him on his milk round in the Redruth area always with his chirpy smile and chat. It was his engaging personality and a huge smile that made him so popular with fellow players and the public. I can well remember prior to the County Final in 1969, Cornish supporters parading a large mascot around the pitch at Redruth to huge cheers; needless to say the mascot was named Bonzo. He was a player who possessed huge strength; once he had the ball you had a job to get it off him. He was a renowned srummager and powerful in the loose and driving with the ball from the front of the lineout. In those days if a player was driven into touch with the ball his side would retain possession when play re-started. “Driven into touch ref” Bonzo would plead to the official; invariably the decision went his way. 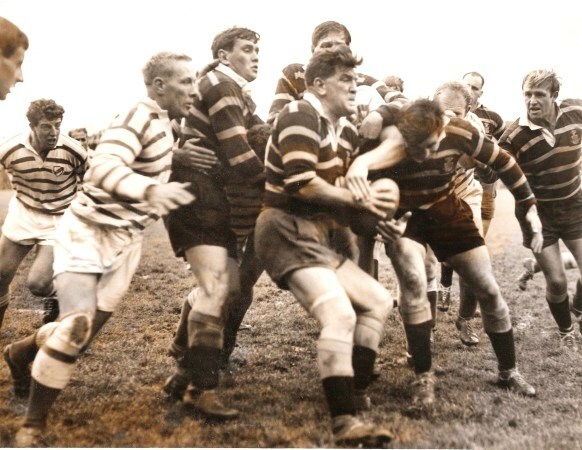 Picture Bonzo Johns in possession at the front of a Cornwall lineout vs Devon at Redruth. Bonzo played all his career 21 years with Redruth and made his debut for the club at the age of sixteen. At that time he played mostly in the second row. It wasn’t long before he caught the eye of the county selectors earning the first of his eighty-eight county caps, which stood as a record for well over twenty years, against the British Police at Camborne in September 1954. He scored the only try in the Championship game against Somerset in October of the same year at Redruth as Cornwall topped the South West group in a run that saw them lose the semi-final against Middlesex at Redruth, however it was Bonzo who caught the eye with a tremendous performance winning lineout after lineout and driving down the pitch with the whole of Middlesex hanging on his back! His performances saw him earn the first of many England trials but to the dismay of everyone in Cornwall and many beyond the Tamar he never got his England cap. Moving up into the front row Bonzo would play for Cornwall in two County Championship Finals against Warwickshire in 1958 and Lancashire in 1969, both were to end in disappointment. Despite not earning international recognition Bonzo was invited by the Barbarians to play in their prestigious Easter tour of Wales in 1962. He faced the might of the Southern Hemisphere Nations playing for Cornwall & Devon against the All Blacks, Springboks and Wallabies. His final appearance for Cornwall was in Clermont-Ferrand when Cornwall drew 11-11 with a powerful French Selection side boasting many future Internationals. After his playing days Bonzo turned to rugby administration both at Redruth and for Cornwall. He was Chairman of Selectors when Cornwall triumphed at Twickenham in 1991 against Yorkshire. There would not have been many happier, nor broader smiles that Cornwall had after 83 years finally won another County Championship. In 2000, Bonzo was made a Bard of the Cornish Gorsedh with the bardic name Gwarier du Hag Owr, which translates to Black and Gold player, he was a true son of Cornwall. The funeral will be held on Tuesday 2 September 2014 at Treswithian Downs Crematorium at 3pm. Trelawnys Army Supporters Club wishes to extend its condolences to family and friends. Many thanks for your comments on Bonzo. I would have been one year old when he played his first game for Cornwall, but I think I saw him play a few times, I started young going to Cornwall games! Thank you Bonzo – and Bill! Cheers Stu, He was just a great character, proper Cornish. Wanted to do something that would do him justice, hope I have.